Crown molding, aesthetically please way to connect help join the wall and ceiling of the room, provides a decorative transition, rather than the standard 90-degree angle commonly seen. Even though crown molding is used as a way to join the ceilings and walls, it can sometimes be used as a way to add a decorative touch to cabinets or mirror frames, to name a few. 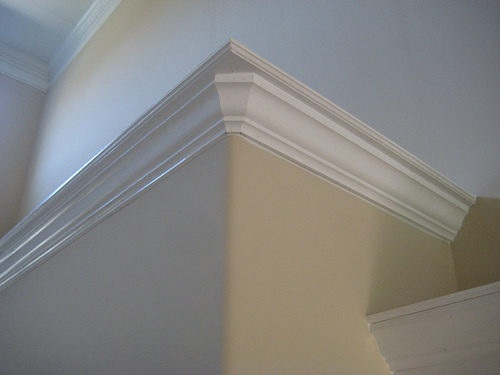 The costs of installing crown molding will depend on a variety of factors, including the materials you choose, the professional you hire, the scope of your project and your geographical location. With so many factors, it’s hard to offer an exact estimate, but from the many quotes we found online, the costs tend to be in the $7 to $13 per foot range, with an additional $40 to $60 per corner needed. It can be hard to offer an exact price as every job is so unique, and for that reason, we highly recommend the free quote comparison tool, HomeAdvisor.com. Here, you will explain your job, and with this information, locally and licensed contractors will contact you with a free, no-obligation quote. The entire process painless, quick and no credit card is required and is considered to be a wonderful way to receive multiple quotes without picking up the phone or searching online for a good contractor. Doors and windows: In some circumstances, adding molding to the windows and doors can often make the room feel more “polished” when combined with the ceiling crown molding. If you wanted to add a similar type of molding to the doors, the costs can range anywhere from $100 to $250 per door and/or $100 to $150 per window. Lighting: To add a sophisticated look, lighting can be added to the crown molding, often via a rope and strip-type setup. Depending on the type chosen, this can, on average, add another $1 to $4 per foot to your total costs, including the materials. Painting/staining: If you need the material painted or stained prior to the install, then this can often add to the estimates as well. At about $25 to $40 per hour, a skilled contractor can paint close to 50 linear feet per hour. Wiring management: Some crown molding material allows you to hide cables behind the molding as it’s being installed due to the inside tracks that are hidden behind the molding, making your device connections look a lot neater. To conceal your wiring, if it were necessary for the job, a contractor may charge an additional fee, often $1 to $3 per foot. Medium-density Fiberboard: Known as MDF, medium-density fiberboard offers the natural look of wood, but a cost that is much lower. Due to the lighter materials, this option can make it a great choice for any room as the weight will not be a problem, nor will the aesthetics since it can be painted just like wood. Being lightweight, though, it is prone to denting during the install and some contractors shy away from it due to the difficulties in cutting customized corners. Plaster: This type of molding often makes for a great choice for larger rooms equipped with plaster walls, and since it cast to walls with an elaborate design, homeowners are often able to create the look they envisioned in the first place. Not know to shrink or warp over time, it can be prone to cracking during the install process and cannot work in all installation scenarios due to the weight. Polystyrene: One of the simplest molding options to install, Polystyrene is known to be so thin, it can be cut with scissors and applied to almost any designs. Often chosen as a material for options where other materials do not work, polystyrene is cost-efficient and will not have many downsides. Polyurethane: Resistant to scratching, rotting and warping, polyurethane is easy to install, very versatile and can work into almost any design. However, like most options, it may not paint or stain as you want it to and can also dent during the install. PVC: Often found in high moisture areas, such as the kitchen and bathroom, PVC molding is hollow, sometimes used as a way to hide cables. Even though it can withstand moisture and make for a great way to hide wires, it will look just like PVC, meaning it will be white in color and cannot be customized. Wood: Solid wood crown molding, often the most popular option, can be carved into various designs, customized with paint/stains and/or even completed as a novice DIY project, but like other materials, it does have its downsides, including warping during the changing of the seasons, and in some cases, it could be a bad choice due to the weight involved. The average cost of solid wood crown molding options, as noted in our table, can vary depending on the choice, but to give you an idea as to how much it may cost you, a popular choice such as cherry could cost about $5 per foot for just the materials, whereas a maple crown molding piece could cost about $3 to $5 per foot, not including the installation. How should I size the molding? It’s highly recommended you purchase at least 10 to 15 percent more in the case of an accident during either the install process in the case of a replacement in the future.